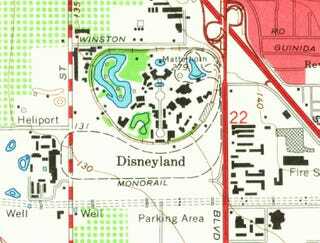 Can you blame the U.S. Geological Survey for having a bit of fun when when it mapped Disneyland? This 1965 topo map from the United States' official mapping agency seems to treat the theme park's Matterhorn—a 1/100 scale model of the Alpine peak—as a real mountain. The map labels the summit and gives its "elevation" in italicized numerals: 279 feet above sea level.